Let’s we imagine a particle that is in a box and it hits the walls of the box with a certain frequency. Let's say that the energy of the box comes from the frequency with which the particle hits the walls. If we start to shrink, the box frequency will become bigger and the energy of the box will rise. But the smaller the box, the better we will know where the particle is, from where it follows that the uncertainty in momentum is going to get bigger. On the other hand, if we have a test object close enough to the box, this object will experience a greater gravitational pull from the box. 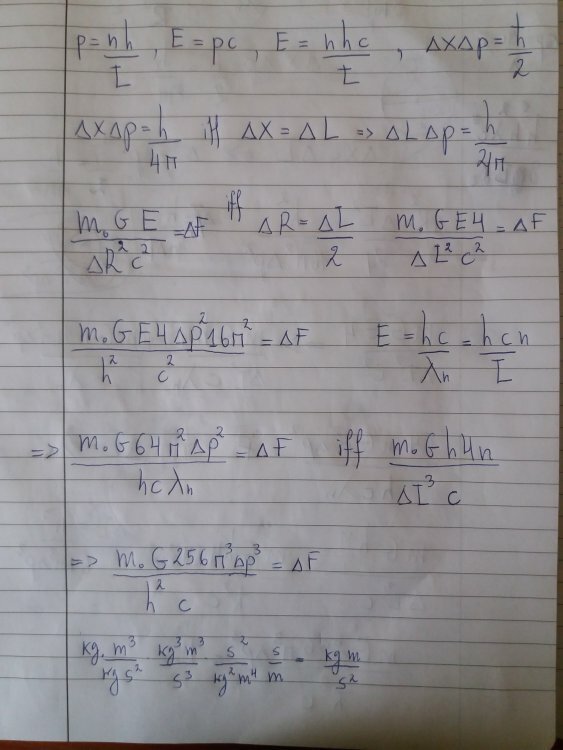 I made a derivation using the Newtonian laws of gravity and I got this formula. I do not see where your original equation comes from. You say you derived it — let's see the derivation. .............................I made a derivation using the Newtonian laws of gravity ........................So where am wrong? Well for a start you require (two or more) masses to apply newton's law of gravity. Do you realise the in the case of "The particle in a box", you not only have a particle you also have a potential field in that box ? In this case I do not need two or more objects! In this formula I use frequency as a source of energy. Derivation is logical. This formula It's just the end result. Apparently I had to put the whole line. I'm sorry fo that! The walls of the box may be visualised as regions of space with an infinitely large potential energy. Conversely, the interior of the box has a constant, zero potential energy.This means that no forces act upon the particle inside the box and it can move freely in that region. You have included G in your expression. Gosh, you have been watching this for 15 minutes without reply. I am simply asking you to identify all the symbols in your expressions. Not to me. I don't get the right units when I analyze your formula. I don't see how you'd get the cube of the momentum uncertainty. I don't know how you can justify that the energy comes from the frequency of the ball hitting the walls. The frequency would depend on the speed and the size of the box. I can change the frequency without changing the energy, when I make the box smaller. I use frequency as a source of energy. How is frequency a source of energy? That is like saying the length is a source of energy. If anything, the frequency of the particle will be caused by energy. The walls of the box may be visualised as regions of space with an infinitely large potential energy. So a completely non-physical setup. This means that no forces act upon the particle inside the box and it can move freely in that region. Then why would its energy increase? Where is the energy coming from? Don't you find that conversation, when there's only one participant is rather like gravity when there's only one mass ? Your equation for momentum is wrong. Did you mean to write that p = nhv (momentum of an ensemble of photons), and then for the frequency, write down 1/t? It doesn't work like that. Your equation for energy assumes a photon. Your equation for ∆F is not derived here; it looks like you just wrote it down. This is complete and utter rubbish. There are and can be no gravitational forces acting when there is only one mass. I ask again , what is G and where does it come from? Further this whole presentation is speculative at best. Momentum of a photon is h/wavelength! L/n =wavelength (this n doesn't mean the number of a particles). So the formula is not wrong! How do you get nh/t from that? And where did you specify photons? You said "particles"
The basic failing here for light is that when you squeeze the cavity down, the energy will not change. You will just have an unsupported mode for the light, and the photon will get absorbed, or tunnel out of the box. I am still waiting for an answer to my question about your introduction of gravity and the symbol G.
Please reply in accordance with the rules here. G is the gravitational constant. I think is clear that. Maybe i don't understand your question. You can see above and see from where it comes. Photons are also a type of elementary particle. Let's say that the energy of the box comes from the frequency with which the particle hits the walls. You still haven't explained what the source of this energy is. Are you confusing the frequency of the photon (which is proportional to energy) and the frequency with which it interacts (which isn't)? Photons are one type of particle, but they are not typical. Most particles have mass. If you meant photons, you need to say that. Your momentum equation is still wrong, you do not show where the force equation comes from, and the idea won't work. A photon reflecting in a cavity will not change its energy when you shrink it. You just lose the photon. Now, as you say it, I think you are right that I confused them. I don't know what you mean by that? This is the momentum formula h/wavelength=p! I just noticed this post from a casual random read. It's wrong. Squeezing down a cavity with implicitly notionally perfectly reflecting walls means work is being done against radiation pressure that naturally resists any shrinkage. Adiabatic process. This in turn MUST result in an increase in photon energy - if net system conservation of energy is to be maintained. The resolution fairly obviously involves that shrinkage requires an initial inward acceleration of wall motions. Relative wall-photon momentum exchange therefore increases over time and that implies an increase in (center-of-system-energy) photon frequency. Invoking photon absorption as 'resolution' is an appeal to material properties (finite conductivity) which cannot be fundamental to the basic physics involved. My original thought was if I start to constrain a particle in less and less space, is it that going to change the gravitational force of that particle, which is acting on a object? So that more uncertainty in momentum will correspond to more G-force. Apparently my thought experiment is not well constructed! Great. Show me an experiment where this happens. The issue, I suspect, is that this ideal system is not physically possible, so you can’t validly make any predictions based on it. Normally, the “impossible” parts of the assumptions don’t matter (e.g. a frictionless surface). But I need someone to show me a mechanism where one does work and changes the energy of a photon, in the manner described here.